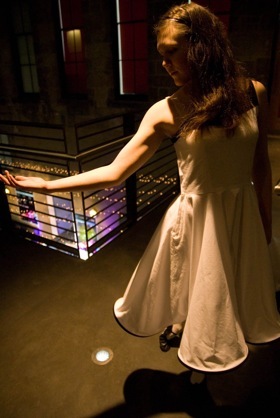 Rosalind Masson is a Scottish dance artist currently based just outside of Glasgow. She has an Msc in Media Arts and Imaging from Duncan of Jordanstone College of Art and Design and a BA(hons) in Contemporary dance. She has recently come back from New York where she was doing an internship with Movement Research. She featured at this year's Heads Up programme at Dancebase, other performances include Ceòs Craic, CCA, Glasgow, Jan 09 in collaboration with American fiddle player Aaron Lewis; 'Be Water', Arches Live 08, Glasgow - to be developed during a residency at Dancebase this coming September; '26 Solos' choreographed by Ian Spink and performed at Pool, The Space, Dundee 08 and Bunty and Doris, Natasha Gilmore Dance Theatre, Gilmorehill G12, Glasgow, June 07. Since returning from London in 2006, Rosalind has pursued her love for dance through collaborating with other art makers, focusing on cross art performance and film. Currently she is working under the direction of Al Seed in conjunction with CONFLUX for a performance at the Merchant City Festival.